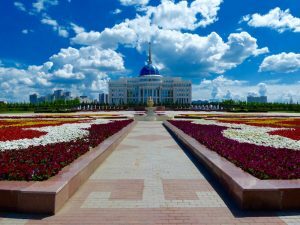 Backpacking Kazakhstan: Why you should visit Astana + Semey! Kazakhstan was always this big, unknown country I didn’t know anything about. Unless the stereotypes Borat provides – a topic you shouldn’t mention to locals! When mapping out my Trans-Siberian Railway trip, I realized how close I’ll actually scratch the country. That’s when I thought “why not – let’s make a detour”! I didn’t regret it since backpacking Kazakhstan turned out to be an awesome experience. I adapted my schedule, leading me from Yekaterinburg into Kazakhstan. 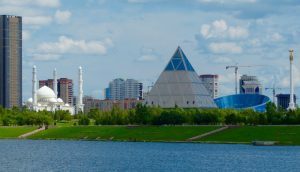 I had stops planned in the capital Astana and the smaller town Semey, before heading up north again into Russia and towards Siberia’s capital Novosibirsk. Looking back, backpacking Kazakhstan was the biggest surprise of my trip and a place you should definitely put on your bucket list. I will tell you why! 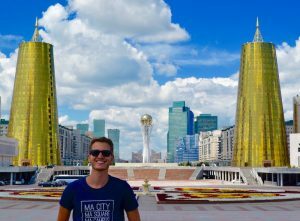 2 Backpacking Astana – the city of the future! 2.1 What to do in Astana? Getting into Kazakhstan from Russia was easier than expected. Luckily, Germans (same as many other European countries) don’t need a visa to get into Kazakhstan. I had to pass two immigration checkpoints. One on the Russian side to get my exit stamp, and one shortly after on the Kazakh side to get my entry stamp. The whole immigration procedure happens on the train; therefore, you don’t need to leave your compartment. Coming from Yekaterinburg, my train got to the immigration checkpoints in the middle of the night. Lights went on, police officers and dogs were running up and down the hallway through the wagons, people were screaming in Russian; I had no idea what was happening. Everyone got up and we had to wait for the border patrol, which was moving from compartment to compartment. After some time, the officers arrived, checked randomly some bags and put an exit stamp on my passport. No one spoke any English, but no communication was needed. The first step was done! Finally, the train started moving again, but only for a short time until we arrived at the Kazakh immigration checkpoint. The same happened, officers and dogs patrolled the train and eventually checked and stamped my passport. The border crossing process was a little bit uncomfortable. 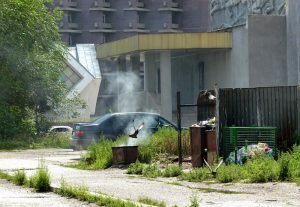 The whole situation including the armed officers, the crazy dogs, and the complete language barrier was strange. Luckily, everything went quite smooth and easy. But make sure to check visa requirements of your respective country in case you’re planning to do a similar trip. One important note: depending on your country, you might need to register your visa when you arrive in Kazakhstan. Please make sure to do some research regarding the specific requirements. 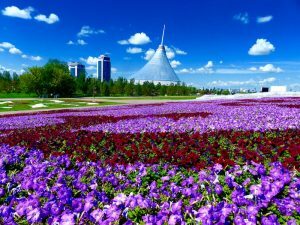 Backpacking Astana – the city of the future! After hours and hours of driving through Kazakh wilderness, my train finally arrived in Astana. I had no idea what to expect from Kazakhstan’s capital. I haven’t even heard of Astana before planning this trip. What I certainly didn’t expect was to find myself in one of the most futuristic and modern cities I’ve ever visited! Astana, you blew my mind! 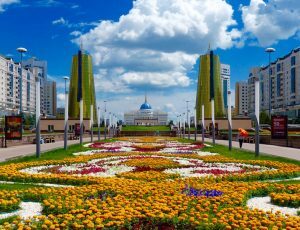 Astana became Kazakhstan’s capital only in late 20th century. Since then, the government spent tons of oil money to build and develop this city in the middle of the Kazakh steppe. From the top of the surreal Bayterek tower, I could see the edge of the city, showing the hard cut between the futuristic architecture and the no man’s land behind. What to do in Astana? Go for a walk to Bayterek tower and visit the observation deck on top. This gives you an awesome view over the city. From there, walk towards the “Khan Shatyr” Shopping Mall and have a look inside for the incredible architecture. Afterwards, walk back passing Bayterek tower to the opposite direction towards the Presidential Palace. From there, you’ll also have a great view of Astana’s skyline with the tower in the middle. This whole area was super clean, well-maintained and almost deserted. If you’re further into walking, cross the bridge and marvel at the “Palace of Peace”-pyramid and the Hazret Sultan Mosque – two architectural masterpieces. You can also go for a boat tour, boats depart further up the Ischim river. I’ve also visited the National Museum, which is a great place to learn a little bit more about Kazakhstan’s history and culture. 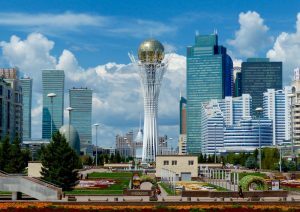 • Astana’s new city center is easily accessible by foot, but you might need to take a taxi to visit other parts of the city. • Don’t expect to meet many (or any) other tourists. • English is rare, but people were extremely friendly and helpful. You can see that not many foreigners make their way to Kazakhstan, therefore the locals are so excited and happy to see some tourists. • I felt very safe walking around in the city. • I stayed at Nochleg Hostel, from where you can easily reach the places I described above by foot. Backpacking Astana was so unexpected, so surreal and therefore a big highlight of my Siberian trip. I can only recommend everyone to stop for 2-3 days and experience one of the most futuristic capitals in the world. After 3 exciting days of backpacking in Astana, my train journey continued east into Semey. The city isn’t particularly a tourist destination. Nevertheless, I felt like I wanted to see a little bit more than the capital of the country. Semey was on the way towards my next stop Novosibirsk and therefore perfectly located. Besides some plazas, churches and a river, there wasn’t much to see or to do and the Soviet architecture wasn’t particularly beautiful. But it was interesting to see a contrast to futuristic Astana and to get a better feel for backpacking Kazakhstan. Semey was also the place where one of my craziest travel experiences happened. While doing some google research about the city, a website about “dark tourism” popped up and named Semey as one of the top dark tourism destinations in the world; due to its proximity to the Polygon nuclear test site in the region previously called Semipalatinsk. I’ve learned that almost 500 nuclear tests were conducted during the Soviet regime; leading to high rates of cancer, birth defects and impotence in the population. While it’s nearly impossible to visit the actual test site, there’s the “Stronger than Death Monument” in the city reminding of the victims of these horrible experiments. But now to the main part which makes Semey a “dark tourism” destination – the Anatomical Museum of the medical university of the city. This small museum exhibits a shocking collection of dead infants and babies; illustrating the horrible effects of the nuclear exposure. Infants are pickled in preserving jars and the look is definitely not for the faint-hearted. You’ll see babies with several eyes, inflated heads and many other deformities. And don’t forget – all of this is real. You won’t see reproduced models or dolls to entertain tourists, you see real and innocent human beings who died early due to the nuclear effects. It’s not so easy to get inside the museum, so if you plan to visit, read further. I couldn’t find much up-to-date information on the internet about this place and the whole area is rarely visited by any tourists. The medical university is directly in the city center and hard to miss. I got there during summer break, but the building was open. I walked in, asked at the reception for “anatomical museum” and after some time, the staff understood what I was looking for me lead me to an office. The vice principal of the university greeted me in good English and offered tea and pastries. Well, this was unexpected! The vice principal was very open and interested in me and my travels and asked many questions. She told me that she’d need to take photocopies of my passport to register me at the “Kazakh FBI”; and that I’d need to meet the university’s president in order to visit this museum. The whole situation got more and more weird and I wasn’t really sure where this would be going. After some phone calls, I got the permission of the “FBI” and the president welcomed me; telling me proudly that he visited Germany’s Oktoberfest a few years ago and how much he liked our beer and food. Shortly after, a medical student introduced herself and gave me a private tour of the university. After visiting several classrooms, halls, and exhibitions, she finally led me to the small room which functioned as the “Anatomical Museum”. I was allowed to take pictures and ask as many questions as possible before my tour finished. I said goodbye to the vice president and the president, both were super happy to have a tourist in their university, and left. Definitely, the most unique museum visit I ever visited! Visiting this museum was horrible and shocking and definitely one-of-a-kind. You might ask “why the hell would anyone want to see or visit this place”? The answer is simple – for me, traveling is not only about fun and beautiful experiences. It’s much more about unique and real insights into a country and its history and culture. This one was real in its own, shocking way and an experience I will never forget. I hope I could inspire you to backpack Kazakhstan! 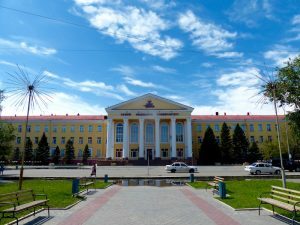 Backpacking Kazakhstan through Astana and Semey was a wonderful detour of my Trans-Siberian Railway adventure and I warmly recommend anyone to consider Kazakhstan when planning your next backpacking trip. You won’t regret it! This entry was posted in Asia and tagged asia, Astana, backpacking kazakhstan, kazakhstan, semey, trans-siberian railway.